What do you mean: “Keep it down!”? I know everyone was getting down and getting intoxicated funky last night. Just because everyone is hungover doesn’t mean we should stop playing, does it? No way! Plus Adam Jacot de Boinod actually emailed me to tell me that he liked Tingo Tuesdays. In case you are new here, here’s how this works. 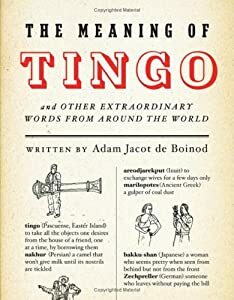 The first Tuesday of each month, I share a word from The Meaning of Tingo & Other Extraordinary Words From Around the World by Adam Jacot de Boinod. So I’m sharing a German word with you. I would think guys would LIKE to wear neckties. After all, they are one of the few fashion accessories that are made especially for them. The way I see it, men have neckties and jockstraps. And while I love a good garage sale, I’m not currently interested in checking out anybody’s junk. Guys, leave me a comment about a time when you acted like a total krawattenmuffel and win a lap dance for just $25.99. And ladies, tell me about that special tie-hater in your life. Comments can be real or fictional. If I love your comment as much as Hubby hates the floral tie I bought him back in 1993, I’ll slip a photo of you into my sidebar so folks can check you out all month! This month’s winner is Kristal Zacharias of Clearly Kristal. To see the comment that won her a month of linky-love, click HERE. It is a masterpiece that will make you totally hate her old elementary school nemesis, Debbie. After you leave me a comment here, be sure to check out Kristal at her place. Just click on her face in my sidebar and you will be magically transported! So tell me about that (real or fictional) “krawattenmuffel” moment. What happened? What color was it? How bad was it? You have until January 31, to enter a comment! The winner will be revealed on the first Tuesday in February! This entry was posted in Tingo Tuesday and tagged Adam Jacot de Boinod, Contest, Fashion, fiction or non-fiction, Fun, Language, neckties, The Meaning of Tingo: And Other Extraordinary Words from Around the World, wordgames, words. Bookmark the permalink. That’s OK. The entire French nation (male variety) are tie-haters. I think only François Hollande and newsreaders wear them here. Drop into the local bank, and the clerk at the counter busily chews gum while he’s talking to you. He’s the one in the out-of-shape T shirt and ripped jeans. French? Stylish? Not round here! They don’t need a word like ‘Krawattenmuffel’. Tie-wearers locally are an endangered species, and may well have disappeared completely by the end of 2013. Margaret: is that true or are you making that up? I can’t tell anymore! Great entry! I speak German, so I actually know how to pronounce krawattenmuffel. It’s as much of a mushy mouthful as it looks like. My lifelong dislike of ties started during my 1970s kidhood when my mother decided I needed a dress-up outfit. She measured my neck, drawing the tape tight, and bought me a shirt with a neck exactly that diameter. Apparently nobody told her that you alsostick two or three fingers under the tape, too, for a little room, or heck, just add a half an inch or an inch. So to this day, wearing a tie absolutely brings back memories of asphyxiation. It’s like mini PTSD! So I wear ties only when the situation absolutely demands it: weddings, funerals, job interviews. I try just not to go to formal affairs. I interviewed for a job in December, so I put on my suit and tie. It was a very casual place. The interviewer said, “I hope you didn’t put that tie on just for us. As you can see, we don’t stand on formality here.” I wore a sport coat with khakis and an open neck to the second interview. It felt liberating! Could you enlighten us on how one pronounces Krawattenmuffel? Well, sort of, kra vaht en miff el. I mean, it’s not something that is easily spelled. Gotcha – well, might be another word I just permanently mispronounce in my head. Google doesn’t seem to offer any spoken pronunciation for it..
That’s because Jim is smart. I like your pronunciation, Joe. Sound Cajun–Craw, as in crawfish, and Muffel, as in muffaltta. Of course Mr. Jacot de Boinod sounds like he’s from the French Quarter too. Hahahaha! As a person who lived in NOLA for many years, that is hilarious. Monsieur is a Frenchman living in London. So much fun emailing with him! That makes me think I should do a post where I creatively interpret phrases in fake Cajun. Jim, come to France for your funerals. You won’t need that tie. My krawattenmuffel moment was embarrassing for both me and my father. I bought my father a tie for his birthday. I didn’t want to get him anything too flashy so I bought him a tie with a statue on it. But when he opened it, it was a statue of a cherub who was peeing! My mother took me aside and hollered at me, saying that I hadn’t looked carefully at what I had bought and that I had embarrassed my father. How could I expect my father to wear that? I was totally mortified. I hadn’t looked carefully and it was days before I could look my father in the eyes. That was my krawattenmuffel moment. Oh, that is awesome! What a pisser! So your mother was the krawattenmuffel in this situation! An interesting twist! 😉 Hapoy New Year, Maire. It was plaid. It was from my Scottish heritage. I loved it–it went with his hazel eyes–a little yellow, a little green, a little beigey brown. I wanted him to wear it at our wedding. He got me pearl earrings. I loved them. He did not love his tie. So, he ended up wearing the pearls (he has pierced ears) and I ended up wearing the tie. Needless to say the wedding was unconventional. Oh, and the tie goes with my eyes too. They are hazel. Fan-freaking-tastic. I wish I had been at your wedding. What a wonderful lesson about compromise in addition to a fabulous krattenmuffel moment! Love it! I am sorry to say that I made it up – was in a funny mood this morning–and I bet you were really wondering about me! If I’m mad, it is only in the good way. As in : “I’m mad for this post!” Sooo funny! thank you — sometimes my imagination runs away with me–it is much more fun than I am! Back in the 1970s, my husband prided himself on being at the height of men’s fashion wearing the popular ice cream-colored shirts and psychedelic ties. I complemented his attire with my own psychedelic wide-leg bell bottoms and turquoise Nehru jacket. As a 20-something and, thinking I was smarter and more ‘hip’ than my conservative-judge Dad, when his next birthday came around I bought him a pastel shirt and a psychedelic tie. In his very superior and old-man tone (I thought), he informed me “Only gay men wear these clothes.” An argument ensued where I clearly stated how utterly wrong he was. The clothes went in his “dresser drawer of death” never to be seen again. They were not alone in that drawer. Over the years, nearly every article of clothing my 2 sisters and I gave him ended up there. You’d think we’d have learned after awhile…nope. Krawattenmuffel! Wow, Marcia. Just wow. Your father is truly a krawattenmuffel. I’m not surprised you are as gracious as you are. we often try to go in the opposite direction as our parents. Meanwhile, is that disco tie still around? It is positively retro, and I’ll bet everything in that drawer would bring you a bring you a pretty penny via eBay! Silver lining? Dang. That would have been excellent! And fun, no doubt. Unfortunately, I have a husband who likes ties. He positively loves getting ugly ties from his sons on Father’s day. (We would spend hours in the store debating on the ugliness of each tie, even dragging strangers into our debate. Store managers were not pleased with our efforts.) He would then wear said ugly tie to his ugly, ultra-conservative day job where every single man there would pull him aside and tell him, in slightly horrified tones, how brave he was to wear that tie. The hubs is an actor – his soul almost died in that ugly, ultra-conservative day job, so I rescued him. He’s now back to working at making a living as an actor. And he still wears the ugly ties. He even wore an ugly bow tie to the industry holiday party we went to on Saturday. Sorry – no krawattenmuffel here – but I simply had to play! Hey, a good anti-krawattenmuffel story is just as awesome. I love that your husband loves his ugly ties. Hilarious. Something to be known for. My grandfather had hideous ties in every color of the rainbow. And that is kind of how I remember him. By his gawd-awful ties. I love this story, Christine! And I’m really glad you left the comment! Fantastic! Tom would be mortified to read this word as he loves ties (and starch and business and seriousness in general). Even though I am a woman I have had a krawattenmuffel moment. When I was seventeen I worked at IHOP as a hostess. As part of the job I was required to wear not only a tie but a vest as well. There was more than one day when I couldn’t find one of the three ties I owned. I really wonder why they make chicks wear ties. I don’t recall the servers wearing them and with the vest I looked simply ridiculous. if you ever find a word that describes a person who doesn’t like vests, I would love to know what that word is! Omigosh Audrey! And those ties were polyester weren’t they? And weren’t they yellow or red or something ghastly? Or maybe they were white and you had to wear yellow vests. Oh please please explain the rest of your uniform. And how much did you hate your customers? The ties and vest were blue with thin grey and white stripes. Polyester indeed. It was ghastly! The costumers weren’t too horrible. The most interesting customers I had was the band Hanson. This was 2001 and they were sporting bad haircuts and a group of giggling girls following behind. I live in their hometown Tulsa. I see them all the time now because all of our kids go to the same preschool and they are pretty normal people with not so silly hair. I come from a family of them! When I got married I told my father that he didn’t have to wear a tie – that I wanted him to be comfortable and enjoy my wedding – so he went out and spent a small fortune on a beautiful handmade Mexican wedding shirt. I don’t think my mother appreciated it but she’ll live! Renee: Thank you for selecting my entry about that snotty Debbie from fourth grade in Tango Tuesday! I really am thrilled – as you’re one of my blogging idols. Once I am done pinching myself over here and collapse from doing my “in-it-to-win-it dance” a few thousand times – I will collapse for the night on this first day of the 2013 with a ginormous grin. 🙂 Thank you again for helping start my year off with a bang! Awesome! To comment on this week’s topic – Krawattenmuffel – my husband is terrified of neckties coming from the beaches of Southern California. He considers them a form of clothing torture (ahem – not in a good way). When first dating, I worked in the corporate world of suits and ties. After work we would meet for dinner out occasionally, he works in the action sports industry of snowboarding and skateboards and his strict dress attire consisted of flip flops and shorts. I would stand next to him in a suit and heels, and the maitre d’ would look at us cross eyed and confused – as if to say, “you two could not be together.” My husband would nod as if to understand ESP restaurant language and say, “Two, please.” I would give an affirming smile to the maitre d.’ Deep inside I knew he was thinking, “How does a classy lady like that end up with a California dude like that?” Sweet, true love is the answer to my Krawattenbuffel. No ties so works for me and my So Cal dude. Look at you! I love it. The former Ms. Conservative hanging out with Super Beach Dude Extraordinaire. Having read your info on your blog, I knew some of this about you, but not all of this! I’m so glad that you showed up to see how gorgeous you look in my sidebar! Hopefully tons of people will flock over to see you this month! Because with the sidebar love come many visits from me — so tweets, too! 😉 Yay! Happy New Year! Definitely married to a Krawattenmuffel… I think I’ve seen him in a tie once a year, if that for the many years we’ve been married. Job interviews only! Luckily in Maine there are rarely if ever events that would beg a tie. Nice to learn a new word! And happy new year! Renee, this is such a sad tale. I had to deviate a bit from your request, as it’s not so much about how my husband hates ties as why the fitted cupboard-building sounds from our loft started to turn into sobbing, some months back. You see, we were being kept awake by these sounds of hammering and sawing from the loft. It was strange, because nobody we know lives up there, but the sounds were definitely someone doing D.I.Y. We’d just have settled down to watching a video of people flashmobdancing on youtube when there’d be this sound: tap, tap, tap, bang, bang, saw, saw (and the occasional squeaky expletive as a nail would be accidentally driven through a paw rather than a roof beam). It was driving us crazy and, as you know, we’re crazy already (or already crazy, same difference). So we decided to investigate. This time, there was sudden silence (not the sudden sound of silence, or any sort of bridge over troubled water, though if I’d looked up there before I’d been to the loo, that would almost certainly have been the case. Well, no ‘almost’ about it.) Yes, the sawing and hammering stopped. This rather puzzled us as neither of us have ever put any ties anywhere near the loft. In fact, both of us detest ties so much that we are hard pressed (or cold pressed) to have a tie near us (you can tell I’m struggling a bit here, can’t you? ), nay even unto a drawer. The voices stopped hissing (and you’ve got to be careful about these voices as the people with those dire strait jackets might come by any minute and cart one away. Okay, cart me away,) and became relatively reasonable. “See, the thing is,” they said (this is translated from Rodential Squeak) “we used to have ties. Ties were very good. We’d come down the cavity walls and through those little gaps in the skirting board and we’d scarper all over the house looking for ties. It didn’t matter what sort of ties they were, striped ties, pink ties, ties with yellow polka dots, flash ties, sad ties, bow ties, if we saw ’em, we took ’em. Then we’d scarper back to the loft and use them to keep our cupboard doors closed. “And then… and then…” YOU two moved in. You two who have Krawattenmuffel, and now none of our cupboards close. And do you know the worst thing? Do you, you sorry humans who have no actual tails but just a residue stump that might have actually been useful once upon a time? And they sobbed. Oh how they sobbed. That was amaaaaaaaaaaazing! Wow. You. Are. Too. Much. I’ll be honest, I’m not a fan of ties. I do like to get dressed up in a suit, although I don’t have the opportunity very often any more. i like the idea of wearing a tie and it always looks good, but man it can be horribly uncomfortable, especially if you are not used to it. I had a suit and tie job early on in life and became immune to the strangling feeling of having something tied around my neck. Not anymore! Cowboys should never wear neckties. Wait, don’t y’all wear bandanas around your necks? Neckerchiefs? Don’t you like those? I bet you look good in one of those. Meanwhile, please don’t even start to talk to me about suffering for fashion. Try a night in those 4″ high heels. Ouch! You make a good point. My daughter a few weeks ago had to wear heels for the first time in her life to go to a formal dance at school. She had to walk around in them for a week just to not be tripping over everything, but eventually got the hang of it. Made my feet hurt just watching! I like dressing up in formal clothes, but that’s because I don’t do it often. Though, if there’s a word for someone who dislikes wearing ties because they’re afraid and don’t know how to tie them, I’ve been guilty of that in my younger years. Fortunately there’s something called the clip-on tie. It’s like a real tie, only it makes you look like a grubby little boy who was told to put on his Sunday best and scrub the caramel off his chin. Maybe I’ve never had one that fit right. When I put on a tie I feel like a dog wearing a choke-chain. Then, if you don’t strap the darn thing down, it flies into your soup like a starving paint brush anxious to apply a fresh coat of spit-pea to your shirt and jacket. Hi Russell. A choke-chain, eh? You don’t like that? ‘Cuz that’s not what I heard. I heard you kind of liked that. I also heard you also liked licking split pea especially off your tie. Especially when that tie was a silk tie. Oh yeah. I have my sources. You had me at “krawatenwhatsit.” 😉 People do leave amazing stories, don’t they? I LOVE Tingo Tuesdays! Ah man. I wish I had seen this about two years ago. That would’ve been kind of hard though, seeing how you only just wrote it a couple of days ago. Anyway, I converted to the LDS Church (Mormon) about a year and a half ago….so now I absolutely love ties!! It’s all I ask for for Christmas, Birthdays, Easter, and Halloween. They are the best, but I guess it wasn’t always that way. (I wonder if this counts? Oh, sure it does….stop talking to yourself) I was a groomsman during my Bruddah’s first wedding. There were three of us. The good thing was we were allowed to wear jeans and a simple button up, white shirt along with some awesome cowboy boots. The bad thing (for me) is we also had to wear a cowboy hat and a BOLO TIE. Do you know how hard it is to look cool while wearing this get up? Sure…I had some epic sunglasses on that made me look like Bocephus. Sure…we had kegs and fifths to help detour the attention away from our hideous ties. Sure…almost all of us were arrested that night, while back roading in my 1988 Lincoln Town car…with the empty keg in the back seat. I still blame that BOLO TIE for all of that grief, even all these years later. Now, we are good! Now I wear colorful ties that match colorful socks. (Mormons be pimpin’…too.) Now….that I have relived that awful night I can sleep better for finally letting it all go. Thank you for giving me this chance to air my problems and disappointments. Thank you for listening. I promise….this is all true. If I could make this kind of stuff up I would be a best seller as we speak. Nice to meet you. I’ve enjoyed it so far and am looking forward to reading more here….and letting go of more of myself. Have a nice night…and a fabulous weekend. Well, like I said…that was my brother’s FIRST wedding, so I’m not so sure if there are any pictures left. That was actually before Facebook too. Crazy. The first time I was a bridesmaid, I was really nervous. At the time, I had the unfortunate tendency to giggle uncontrollably at inappropriate moments, and I was afraid I’d do that during the ceremony. I was also feeling pretty insecure about how I’d look, partly because I was by far the shortest person in the wedding party (I dealt with that by wearing super-high heels) and partly because of what I’d have to wear: instead of having us buy traditional bridesmaid’s dresses, the bride decided we’d rent white tuxedos, complete with bow ties. It all worked out in the end. The excruciating pain from the shoes kept me from laughing, and the constant feeling of being strangled to death by the tie took my mind off how much my feet hurt. Is that for REAL? You endured strangulation and pinchy toes? That’s like one of the circles of Hell, I think. Awesome. I love when women where black tie! So. Much. Fun. It’s all true — also, the tux pants were way too big, and I had to use safety pins to keep them from sliding down. It was not my finest fashion moment. (I had a great time in spite of it all, though, because I got to spend time with some really good friends). I love it so much! Nice to have your entry! And to meet you! My husband definitely falls into the krawattenmuffel category. One day we had to attend something formal, and he decided to (rebel?) spice things up a bit. He wore a tie that had a photo of a naked woman on the inner lining. I saw him slyly showing it off to other men who couldn’t help but howl with laughter. He was mighty proud, and envied by many. Oh it was made that way! I don’t remember how he ended up with it in the first place, but stories of him wearing it at “in-opportune” times still come up now and again! Ha ha ha!!! I sort of wish my husband hated ties. He’s obsessed with them and is always asking me what ties to where with certain shirts. I’m terrible at shirts and ties. All looks the same to me. I hate wearing swimsuits. Special name for that? I don’t know about a name for that. Happy new year Renee and all readers. I don’t know if this qualifies me as “Krawattenmuffel.” but many years ago I did attend a meeting at the White House without wearing a suit, tie or dress uniform. I was the only person at the meeting without a tie or dress uniform. I got a few dirty looks from some lower ranking white house staff. One of them dared to comment about it to me during a brake and I explained that the lack of tie was an important part of my disguise. The idiot was satisfied with my explanation. It’s just as well that he was because my next response was going to be less polite. You went to the White House without a tie? For reals? I think I would even wear a necktie to the White House. You have balls, Homes. 😉 But I’m glad you put the dolt who dared to say something in his place. Making others feel uncomfortable is just rude, no matter what the venue.